Mussar Yoga meets students at their current level of interest, knowledge, and ability while also encouraging deeper exploration over time. Different spiritual communities often have more in common than we recognize at first glance. Indeed, it might seem that “yoga, derived from Hinduism and Buddhism, and Mussar, steeped in Eastern European Jewish Orthodoxy, are a strange combination,” as Edith Brotman writes in her informed and practical guide to the meeting place between these two unlikely bedfellows. Yet, as she goes on to explain, both traditions address the “universal desire to better ourselves and improve the world around us.” In Mussar Yoga, Brotman not only explains the kinds of advances that can be made by meshing the two traditions, but she also offers a multifaceted program for experiencing them firsthand. An experienced teacher of yoga classes as well as embodied Jewish learning workshops, Brotman clearly knows how to engage her students. 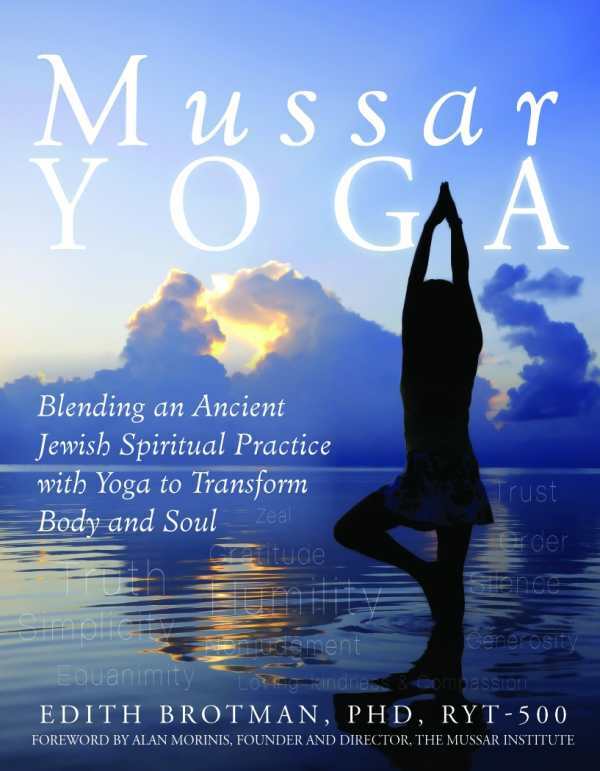 After she lays out her basic premise—that Mussar and yoga both emphasize instruction combined with self-inquiry and can jointly be used to promote thirteen virtuous “soul traits,” she moves briskly into a series of weekly practices designed to promote these virtues through physical, psychological, intellectual, and spiritual exercises. In thirteen distinct chapters, Brotman encourages students to use a variety of tools to develop personal attributes like courage, humility, simplicity, gratitude, and trust. Helpful photographs clearly illustrate the yoga poses associated with each attribute, such as Mountain Pose, which Brotman recommends for seeking truth. Her easy-to-follow instructions accompany the pictures, making the book ideal for home practitioners. Additionally, each chapter provides valuable context for the exercises (Hebrew and Sanskrit vocabulary, for instance) and tools for deeper self-exploration, such as journal prompts and suggested mantras. While this book is more of a manual to be followed than a philosophical textbook to be studied, Brotman does include a brief overview of each topic, its history, and its place in the modern world. Her sources run the gamut from lighthearted memories to difficult historical moments like the Great Depression. The variety makes her philosophical reflections accessible to a wide variety of readers. Chapter notes and an extensive listing of resources encourage readers to explore these topics with further study on their own. What to do when you finish the thirteen weeks? Start over, says Brotman, because each time you take up these practices, you bring something new to your mat, and the exercises have more to teach.